This LaChrom Elite Autosampler represents a new standard of performance for HPLC autosamplers. 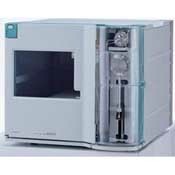 Whether you need high sample capacity, the very best precision, lowest carry-over, or rapid cycle times between injections, the LaChrom Elite Model L-2200 excels. With the flexibility to use standard vials or microtiter plates and the ability to reproducibly inject as 0.5 mL, it is the perfect sample management platform for the LaChrom Elite HPLC System. A wide range of injection volumes from 0.1 mL to 4.5 mL. Two valve design for short cycle time. Thermoelectric cooling option can be used to prevent degradation of sensitive samples.